After 5 years of marriage, Seyi Law and his wife Ebere have welcomed their first child. This is such great news especially after they told the public of the heartbreaking loss of their baby in the U.S. last year. 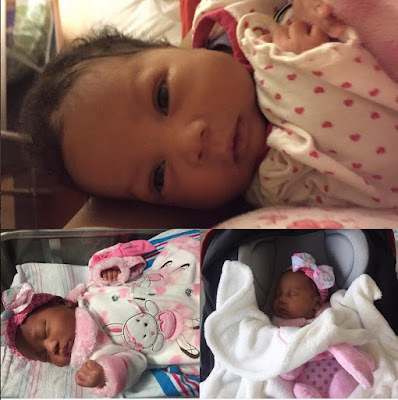 The beautiful baby girl has Igbo and Yoruba names – Oluwademiladeola Chidera Aviella Tiwa to celebrate both her parents’ heritage. Seyi also joked that she’s a blessing from ‘the other room’, referencing President Buhari’s comments this week about his wife Aisha belonging in the kitchen, living room and ‘the other room’. Here’s what Seyi said about his bundle of joy, and about his wife being his Number One baby. Guess who is the prettiest? She is our God given product from THE OTHER ROOM. My Joy, My Blessing, My Strength. My wife is still the number One baby sha.